So, today we say goodbye to 2011, and for me it’s been an immeasurably better year than the previous two. Events on the day job front dominated, above all negotiating and helping to implement my firm’s merger, and as a result of that, I’ve done much less fiction writing than usual. A pity, but a price worth paying, as I am now hopeful that I will have more time to devote to fiction in the future, reducing from full time working in the not too distant future. The photo was taken on a research trip around Ullswater and I hope the memories of that lovely day will inspire me to write more next year. In publication terms, it was a productive year, though largely because of work I’d done in 2010. The Hanging Wood was published, and earned terrific coverage in The Times, The Guardian, The Literary Review and elsewhere. I was really gratified about that. Reviews are bound to be subjective, but they do matter to any writer (as well to his or her publisher.) And I also edited two anthologies, Guilty Consciences and Best Eaten Cold. I was lucky enough to be directly involved in some great events, including no fewer than six festivals of different kinds – The Wordsworth Festival, the Newcastle Winter Books Festival, the Lymm Festival, Crimefest, the Harrogate Theakston’s Festival, and St Hilda’s Crime and Mystery Week-end. I wrote a new murder mystery event set in the 1920s, gave a range of talks, and was awarded a Red Herring for services to the CWA. So perhaps I was busier on the literary front than I realised at the time. I was also very fortunate to spend a delightful week-end on the Isle of Man, much of it spent in the company of that fine writer Chris Ewan and his wife, as well as going on four trips overseas – all of which provided me with background material for future short stories. I’ve read excellent novels by friends such as Peter Lovesey, Ann Cleeves and Kate Ellis, and the most impressive contemporary American book I read this year was The End of Everything by Megan Abbott. I also continued my research into the Golden Age and read some excellent books from the past. For me, the highlight among the latter was The Pursued by C.S. Forester, a remarkable discovery. I've also enjoyed discovering Jessica Mann's early work, and some classics by John Dickson Carr, Henry Wade, J.J. Connington, C.Daly King and others. One area where I have been remiss is in keeping up with other people’s blogs. I’ve spent much less time on this than I’d have wished, but I must say that the quality of some of the crime-related blogs, many of which are listed on the blogroll, is quite splendid. And it seems to keep improving. An interesting feature is the increase in the number of blogs dealing with Golden Age books - very pleasing to see this trend. I do feel very grateful for the interest taken in this blog by so many people, and when I get the chance to meet some of you in person (for instance, this year I’ve had the very welcome opportunity to chat with Dorte, Kerrie, Karen and Paul Beech among others) I find it an enormously enriching experience. So – thanks for all your support and generosity in 2011 and let’s hope that 2012 is a good year for the crime fiction community, and (is this too much to hope for, given the economic climate?) is a better year for the world as a whole. Fear in the Night is a film noir directed by Maxwell Shane in 1947 on a rather obviously low budget. It was based on a short story by William Irish, aka Cornell Woolrich, and was re-made a few years later as Nightmare starring Edward G. Robinson. In this version, Forrest DeKelley, later Bones in Star Trek, made his movie debut. It may not be the most sophisticated mystery I've ever watched, but I found it rather enjoyable. There is a highly-wrought atmosphere from start to finish, as the man who believes he is guilty finds he cannot live with himself, even though he does not have a clue why he would have killed someone he didn't know. The solution is rational, and reasonably entertaining. Woolrich was a master of the 'emotional thriller'. The only writers to equal his mastery in this field were Boileau and Narcejac. It's no coincidence that their books, like Woolrich's, were often made into films. They are highly visual, as well as dark. Woolrich, by the way, was gay, and I've read an article which suggests the film has a strong homosexual sub-text. But if that's right, it was lost on me. Although this blog is about crime writing and not about my family, it wouldn’t exist without the young man who designed the template (and updated it recently) and set me on the right road, and who also designed and continues to maintain my website. As Jonathan is 21 today, I should take the chance to pay tribute to his good humoured support and encouragement for his technologically incompetent father, and thank him for all his hard work. And to thank him also for his terrific companionship, not least when he and I went on a short holiday to Rome earlier this year, when the photo was taken. I still can’t believe that it’s 21 years since that amazing day when he was born. A day which will always remain among the most memorable of my life. Well done on 21 great years, Jonathan, and all the very best in terms of health and happiness in the years to come. Agatha Christie's Poirot remains a real treat whenever I come across a new episode, and The Clocks has been the highlight of my holiday viewing so far (not that the competition has been hot or even warm, admittedly, given that I've never got to grips with Downton Abbey). The Clocks is a relatively late Christie novel, first published in 1963, and it's not rated very highly by connoisseurs - though I have always liked the story. The discovery of a corpse surrounded by a mysterious array of clocks is a great plot device, and even though Christie's explanation is, some would argue, a cop-out, I find it striking and memorable. Another pleasing aspect of the book is Poirot's discussion of great detective novelists, including a passing reference to John Dickson Carr, whom Christie knew and admired. There is also mention (crucial to the story-line) of a prolific author called Garry Gregson, who I believe was based on John Creasey. I wondered how the scriptwriter would adapt the novel for television, because the story-line does throw up a lot of challenges - not least the fact that Poirot only takes centre stage quite late in the book. Stewart Harcourt's solution was to adapt very freely indeed, and move the story back in time by a quarter of a century - a risky course. There have been all too many Christie adaptations over the years where radical changes have been made, and the result has been a bit of a mess. But that isn't always the case, by any means, and I'm not one of those purists who believes that a novel must invariably be translated to the small screen in a totally faithful fashion. The screenwriter often needs to have some licence. And in this case, I felt that the end justified the means. The mystery was pleasingly unravelled, and although I had one or two quibbles, I found the two hours passed very agreeably: Harcourt did a good job. David Suchet, as usual, was splendid as Poirot. It was especially poignant to see the late Anna Massey playing the part of the blind but sharp-witted Millicent Pebmarsh - she was a terrific actor. And the supporting cast was good, with none of the over-the-top acting we've seen in one or two Poirots and Marples. I've now finished work for the Christmas break, one that I've been looking forward to. A chance to relax and also reflect on what has been a momentous year for the whole world, and certainly momentous and memorable for me. I'm also hoping to do plenty of reading - got to make an impact on that TBR pile somehow! In fact, it's not so much a pile, more a mountain range of Himalayan proportions. There have been, of course, plenty of mysteries set at and around Christmas. Hercule Poirot's Christmas is probably the most famous, but my favourite is Cyril Hare's An English Murder. This is a classic mystery by one of the most agreeable stylists at work in the genre in the 20th century. If you like older books, and don't know this one, do consider giving it a try. And now all that remains is to wish you all a very happy Christmas, and to express my grateful thanks for your support for this blog, and for your consistently constructive and thought-provoking comments. More posts soon, but now I'm off to wrap presents! J.J. Connington was a reliable Golden Age writer, and it’s rather surprising that In Whose Dim Shadow, published in 1935, truly is a Forgotten Book. The copy I’ve just read, generously lent to me by a keen collector, boasts a wonderful pictorial dust jacket with a map of the scene of the crime, perfectly in keeping with Golden Age tradition. This novel features his regular “Holmes and Watson” duo, the Chief Constable Sir Clinton Driffield, and his friend Wendover. They are upper class figures, but decent men who are not snobbish – in fact, their attitude towards characters who are dismissive of working class people is one of disgust. This slant on the class system is a reminder that class divide issues in Britain were, and perhaps still are, rather more complex than they might seem. Connington is not known for his characterisation, but there are a number of points in the story when he makes observations about human nature that I thought were quite acute. And as detective novelist, he strikes me as under-rated. This case involves the discovery of a body in a flat, and the victim proves to have been a bigamist. The mystery is cleverly contrived, with a neat story-line, not too much padding (though I admit the pace isn’t electric) and a good solution. The only real snag is that Connington is so keen to play fair with the reader that, to my mind, he gives too many clues and makes it too easy to solve the problem. But it’s an enjoyable story, all the same. 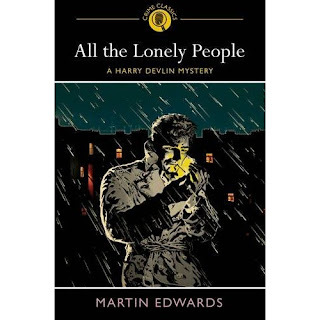 It’s now over 20 years since Harry Devlin made his debut, when my first book, All the Lonely People, was originally published. It was a marvellous experience for me, becoming a published novelist at long last, and not surprisingly I have very fond memories, not only of the book but of that whole period in my life. The book was published in paperback by Bantam, a division of Transworld. When the Devlin series was acquired a few years later by Hodder, a new paperback edition was produced. Sadly, though, this edition has been out of print for quite a while. This is a common problem for authors – unless they are best-sellers. One’s early books are no longer available in current editions, so it's hard for readers to track down those books. However, I am very happy to say that All the Lonely People will next year enjoy its third incarnation in a paperback edition. This is because those enterprising publishers Arcturus have decided to include the book in their Crime Classics series. Given that other authors featured include Anthony Berkeley, whom I admire so much, and the likes of Francis Durbridge and Ethel Lina (The Lady Vanishes) White, I am flattered, as well as delighted. I’m fortunate indeed to have a book which has been paperbacked by three different publishers, and All the Lonely People has certainly been a very lucky book for me. The Killing II finally came to an end this week-end. I'm not going to talk about the story-line in detail, because I imagine that some readers of this blog will be wanting to catch up with the later episodes in the near future. But a few thoughts do strike me. This was a show of ten episodes of an hour each, which I felt began very well, and also ended strongly. At first I thought there was a tocuh of early Taggart in the enigmatic and inter-related story-lines, but this comparison only survived the first couple of episodes. Althought the plot was tangled, and had one or two good aspects, it wasn't as clever as the work of Glenn Chandler, who created Taggart. The acting was good and the production values were pretty high. However, I felt the story sagged very badly in the middle. There were stretches when I was rather bored, and this was because the characters' relationships, although not without interest, weren't compelling enough to sustain such a protracted exercise. The political aspects of the story really didn't excite me at all. I am still intending to watch the original series of The Killing, which attracted so many rave reviews. But overall, I'd have to rate The Killing II as a disappointment. It had a number of strengths, but to justify ten hours of story-telling, you need to have a really outstanding tale to tell. For me, at least, The Killing II too often felt like an endurance test. The story simply wasn't strong enough to justify such an investment of time. My forgotten book today is an obscure but extraordinary novel written by a fascinating, idiosyncratic and sometimes maddening American Golden Age storyteller. The book is Careless Corpse, first published in 1937, and the author C. Daly King. And it included that odd paragraph on economics that I teased you with yesterday. I’ve mentioned King before in this blog. He was a psychologist who wrote books on the subject, and he drew from his professional expertise for his novels. But this did not take him down the road of “psychological suspense” – his fiction bears no resemblance to that of Francis Iles, say, or C.S. Forester. On the contrary, he specialised in elaborate puzzles, often weighed down by strange digressions into academic debates. An example is the passage I quoted in my quiz question. In this novel, a series of deaths occur among members of a party of celebrities – including a concert pianist, a violinist, a dancer, a composer, and a musical critic. The party is organised by a wealthy scientist, and the setting is an island amid the ice-floes of the Hudson River. As so often, King provides helpful diagrams – no fewer than five – and arranges the text in a series of “movements” to underline the musical aspects of the story. The plot is elaborate and wildly ingenious (and, of course, improbable) and there is some entertaining writing mixed in with a bit of padding here and there. I don’t claim this book is great literature, but I really did enjoy it as a light, escapist read. Here’s an extract from a book I’ve just read. It amused and intrigued me because the passage was written in 1937, yet arguably it has a modern resonance in these troubled economic times. But the question is – do you know which book it appeared in? I will be very impressed if anyone knows the answer – but I’ll put you out of your misery tomorrow! I never met Gilbert Adair, but I was sorry to learn of his death a few days ago. He was only 66, and suffered a second stroke; the first, it seems, had robbed him of much of his vision, a tragedy for anyone, but certainly for someone who loved reading as much as Adair must have done. I've mentioned Adair once or twice before in this blog. He was a sophisticated writer, with a real interest in detective fiction. I read his A Closed Book when it first came out years ago, and enjoyed it. Some people see it as a sort of updating of Francis Iles, one of my favourite crime authors of the past. In recent years, Adair had dabbled in pastiche, and he produced three books boasting titles which are riffs on Christie classics – And Then There Was No One , a very tricky piece of work, was his last published novel, as it turns out. His books tended to get a mixed reception from Golden Age fans, but there was no doubting Adair’s flair, intelligence or ability to see things differently. One of his titles was The Postmodernist Always Rings Twice. You either like that kind of joke, or you don't, and I definitely do. A fascinating, if controversial proposition – and thus typical of Gilbert Adair’s work.How I wish I’d had the chance to meet and talk with him and get a better insight into a brilliant mind. Dorothy L Sayers had a huge admiration for her Victorian predecessor Wilkie Collins. I too am a Collins fan, and it's interesting to see the ways in which his work sometimesinfluenced hers. Perhaps the most notable example is to be found in theepistolary form that she adopted for her non-Wimsey novel The Documents in theCase. For many years, Sayerstalked about writing a biography of Collins. She did start work on it, butnever managed to complete it – for reasons that are not entirely clear. She hadall the attributes, certainly including a gift for scholarship, that would haveequipped her ideally for the task. I've often wonderedabout the incomplete biography, and recently John Curran told me that it hadbeen published, but was very difficult to obtain. Now, thanks to the kindnessof Christopher Dean, the chairman of the Dorothy L Sayers Society, I have beenable to borrow a copy, which I read with much interest. There are one or twopassing observations to her fellow detective story writers, J.J. Connington andHenry Wade, but sadly, the manuscript finishes before Sayers reaches the pointin Collins' life when he wrote his masterpieces, The Moonstone and The Woman in White. What a pity that we do not have a really detailed study of those booksfrom Sayers in the context of Collins' life story. Perhaps she meant to returnto the book one day in the future. Her sudden and rather premature death meantthat she did not have the chance to do so – and we are the poorer for it, eventhough it is pleasing that the fragment remains in existence. Jessica Mann is a writer of very interesting novels, some of which I’ve mentioned in the past. She’s also a critic and commentator, with a very good full-length study of female crime writers, Deadlier Than the Male, to her name. Jessica has now started a blog with discussions about “pre-feminism for post-feminists”, a topic that really is much more fascinating than that tag-line may suggest. You could argue that feminist issues are at the heart of much of Jessica’s fiction, but her novels are certainly not didactic, and any points she wants to make don’t get in the way of the story. The blog anticipates the appearance next spring of her latest non-fiction book, The Fifties Mystique, which evidently talks about some issues of concern to feminists. But whether or not one labels oneself as feminist, I’d expect it to be a very interesting piece of work. As a male reader who enjoys many books written by women and featuring female characters, I’m looking forward to it. On the subject of blogs, you’ll have gathered that I’ve been having continuing problems with the new version of Blogger. My apologies – and thanks for your patience. My webmaster is now back to help me get things sorted out - hence the new layout. There are still some issues to iron out, but I hope that both the blog and my website will be looking better and more up to date before Christmas. Spangle, who has kindly contributed quite a few comments to 'Do You Write Under Your Own Name? ', has a blog herself, which I've belatedly added to the blogroll. She invited me to contribute a piece to her 'Chapters in My Life' series, and this is the link to her blog. My Forgotten Book for today was published in 1977. Desmond Cory (a pseudonym) was a prolific writer of thrillers who occasionally dabbled in psychological suspense. Bennett was his last foray into that field, and I suspect that it was not a particularly successful book. It is, however, by any standards a pretty extraordinary piece of work. Part of the book takes the form of a journal, ostensibly written by a detective novelist called William Bennett. He has gone missing in Spain, and a young cop called Hunter has come out to try and find him, in connection with the death of an au pair girl back in Britain. The case has some echoes of the Lord Lucan case, but Cory’s concern is not to offer a “solution” to that famous mystery, but rather to indulge in an intellectual game with the reader. Are there two journals, are there two men claiming to be Bennett? And does Hunter have a close personal connection with the man he is... hunting? I first read this book not long after it came out. I was disappointed by its anti-climactic nature, and I suspect most other readers shared my frustration. At least one reviewer described the book as boring. But on re-readng it, I had more sympathy with Cory’s attempt to do something very different with the crime novel. It’s certainly intelligent, original and unrepeatable. And there are some fascinating allusions to classic detective fiction – such as The Wraith, an obscure book by Philip Macdonald – which are not fully developed, but which somehow give the book a bit more depth. Bennett may be a failure, but it’s an intriguing failure and is well worth inspection – as long as you don’t expect the orthodox. Whilst on holiday recently, I had the opportunity to watch the recent movie Devil and I found I enjoyed it immensely. It’s a modern film, and yet it has some distinctly classic elements. So when, after watching it, I read about the film on the internet, I wasn’t surprised to learn that M. Night Shamaylan, one o the team behind the film, and famous for the spookiness of his work, acknowledged that the story involved a nod to Agatha Christie. More than a single nod, in fact. The main story is a riff on And Then There Were None, but in the dialogue there is also a hint of the plot-line from The ABC Murders. Suffice to say that I thought the film-makers used the Christie inspiration pretty well. The story is taut (the film only lasts 80 minutes, and the brevity of the film helps to ensure that the intensity of the narrative is maintained) and compelling. An elevator in a skyscraper gets stuck and it seems that Satan is in there along with the five passengers. One by one, they meet grisly ends. None of the actors was familiar to me, but they all did a decent job, and I felt that the film was well done, and the story presented in compelling way. The claustrophobic environment of the elevator in particular is beautifully conveyed. Devil is a world away from Fatal Descent, an elevator based novel I discussed here recently. But it’s much better than the Golden Age book by John Rhode and Carter Dickson, and, despite the lurid nature of the plot, it is strangely more credible. I have written before in this blog of my huge admiration for Ruth Rendell. At one time, I had read every novel and short story she'd published, both under her own name and as Barbara Vine. In the past 10 years or so, however, I've missed a few titles, and I've rather felt that (with a few notable exceptions) her most recent books have not quite reached the remarkable standards of excellence that she set in the past. But she remains a gifted writer, and I'm keen to fill in the gaps. 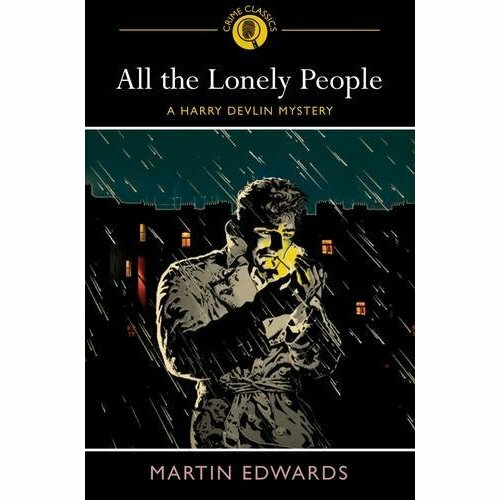 I decided that I'd try an audio book version of one of her Wexford stories, and was tempted by End in Tears, especially as it was read by Christopher Ravenscroft, who was so good on television in the role of Detective Inspector Mike Burden. I really like the Wexford series, and I also admired the performance of the late George Baker as a very believable television Wexford. End in Tears is a well-constructed mystery, although not ideally suited to audio book abridgement, which led to a slightly fragmentary narrative and perhaps too many characters. The social comment element here is about surrogacy, and I found this fairly interesting. But the actual murder motive was, to my mind, genuinely fascinating, and neatly concealed. This book may not rank with the best of Wexford, but it is still enjoyable and I'm glad I've caught up with it at last. I started watching a 2010 movie, The Resident, with high hopes. It’s a short thriller from Hammer, starring that very appealing actress Hilary Swank. She plays a doctor who does a lot of running to exercise her mortification at having split up with her philandering ex. She decides to move apartments, and finds a new home that is full of character and remarkably cheap. There is a ‘but’, of course. As soon as we meet the owner of the building, played by Jeffrey Dean Morgan, we somehow suspect (for this is scarcely an original situation) that, for all his superficial likeability, he may well turn into a deranged killer. This impression is confirmed when we find that his strange granddad is played by – yes! - Christopher Lee. Short the film may be, but I’m afraid that for me, it was still too long at an hour and a half. I thought the screenplay was clunky as well as predictable, with a long-winded flashback killing suspense quite early on, and although visually the film is quite effective, with the weirdness of the building well evoked, overall it was a dreadful waste of the talents of three excellent actors. Aspects of the story are salacious, voyeuristic, and gory, and although very good films can be composed with such elements The Resident is too crassly put together to survive its flaws. It hasn’t received generally good reviews, and even some of the indifferent notices strike me, I’m afraid, as rather on the generous side. Very disappointing. John Curran recommended me to give a try to Cry of the Owl, a 2008 movie based on Patricia Highsmith's book, written nearly 50 years ago and previously filmed, in a version I haven't seen, by Claude Chabrol. It's an interestingly different film, and you can never be sure how things are going to develop. As so often with Highsmith, the characters behave oddly. A man called Forester, played by Paddy Considine, who has suffered depression and is getting a divorce from his gorgeous but rather unpleasant wife becomes obsessed by a couple who live in an isolated house in the woods. He spies on them, but in a curiously innocent way. The couple's relationship is in difficulty, and one night Jenny, the woman, played by Julia Stiles invites in the watcher. This is unexpected enough, but soon she starts stalking him. Her lover takes this amiss, and in a struggle, Forester hits him, but doesn't kill him. However, the man disappears, and before long Forester is suspected of his murder. His world continues to fall apart. Jenny commits suicide and someone tries to kill Forester. The police react disbelievingly and he is suspended from work. I found a lot of this implausible, to say the least. And yet, strangely, I remained intrigued and wanted to find out what would happen next. Suffice to say that the story didn't become any more plausible - far from it - but despite its flaws, I was glad I watched it. There was one nice twist and Considine's performance is very watchable. He is an actor with a good line in innocent weirdness. I first read Julian Symons’ 1972 novel The Players and the Game as a break from A Level exams revision shortly after it first appeared. I was a huge Symons fan then – as I still am – and I really enjoyed the book. A welcome distraction which did me a lot of good at the time, despite its grim subject matter. So I wondered how well it would stand up to re-reading. The answer was – extremely well. I now knew the trick solution, but this time had the chance to admire how Symons concealed it from the reader. This is a book influenced by true crimes – notably the Moors Murders – where two people combine to wreak homicidal mayhem. I’m one of the many who have more recently written such a story, but few of us have matched Symons’ skill. The book opens with an extract from a journal written by a mentally disturbed man who confuses himself with Count Dracula/Bela Lugosi, and meets a woman who sees herself as Bonnie Parker. The action then switches to a husband and wife buying a house; Paul Vane is a personnel manager who is moving to be nearer his work, but the move proves to have disastrous consequences. Two young women go missing. One eventually turns up, but it soon becomes apparent that a serial killer (or, rather, two serial killers) are on the loose. Symons shifts viewpoint rapidly, introducing a good many characters, but he sketches them with great clarity. Which man and which woman form the killer couple? It’s a really ingenious story, as clever as most Golden Age efforts, but it’s worn really well, with only a couple of aspects that seem dated. Symons explores the way that people wear masks to conceal their identities, and also provides a bleak picture of a man, Paul Vane, whose life falls apart. This is a really excellent mystery, much shorter than most present day serial killer stories and the better for it. I can’t understand why it isn’t more widely known.